Vesna's Party Blog: Let Them Eat Cake! 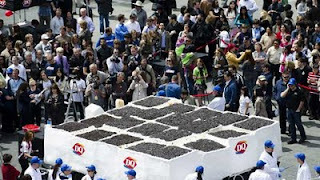 To mark it's 30th anniversary, Dairy Queen recently broke a Guinness World record for largest ice cream cake, weighing in at a whopping 22,334 pounds - that's 10 tonnes of ice cream! The previous record belonged to Beijing Allied Faxi Food Co. of China in 2006 with 19,290 pounds. It took over a year of planning, dozens of DQ chefs, and a whole lot of ice cream to achieve this much deserved accomplishment. Hundreds of people gathered the streets of Toronto to get a glimpse, and a taste, of this colossal "Cool Treat." The money raised at this event would go to the Children's Miracle Network and Hospital for Sick Children. A Royal Hat Party Anyone?